The Resolute and Faithful Khalsa. The resolve of the Khalsa forces is strengthened as they come together for the Antim Saskar of Shaheed Bhai Mengha Singh Ji Babbar. 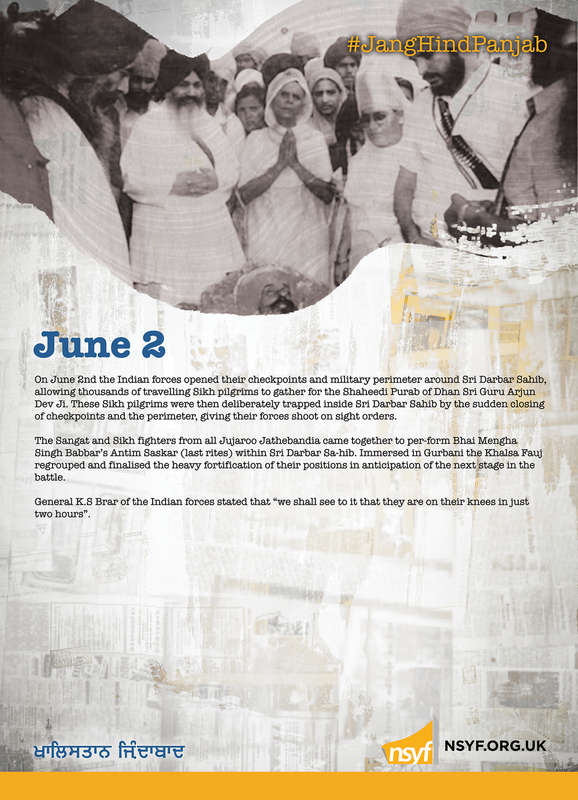 On June 2nd the Indian forces opened their checkpoints and military perimeter around Sri Darbar Sahib, allowing thousands of travelling Sikh pilgrims to gather for the Shaheedi Purab of Dhan Sri Guru Arjun Dev Ji. These Sikh pilgrims were then deliberately trapped inside Sri Darbar Sahib by the sudden closing of checkpoints and the perimeter, giving their forces shoot on sight orders. The Sangat and Sikh fighters from all Jujaroo Jathebandia came together to perform Bhai Mengha Singh Babbar’s Antim Saskar (last rites) within Sri Darbar Sahib. Immersed in Gurbani the Khalsa Fauj regrouped and finalised the heavy fortification of their positions in anticipation of the next stage in the battle. General K.S Brar of the Indian forces stated that “we shall see to it that they are on their knees in just two hours”.